I was able to step out onto our front walkway to discover these blessed early tulips pushing their way through the soft earth yesterday, the second day of Spring. It snowed all day. This morning is bright and the clouds are clearing. Perhaps some inner clouds too? In this breath, yes, most certainly. In my meditation this morning I focused on one word. Hineni. Here I am. Announcing myself with my breath to the morning, much like yesterdays tulips and snow, and today's radiant sun. Hineni. Here I am. So beautiful, Laura. The leaves do seem like receptacles that aren't upset by the snow encountr. Beautiful! 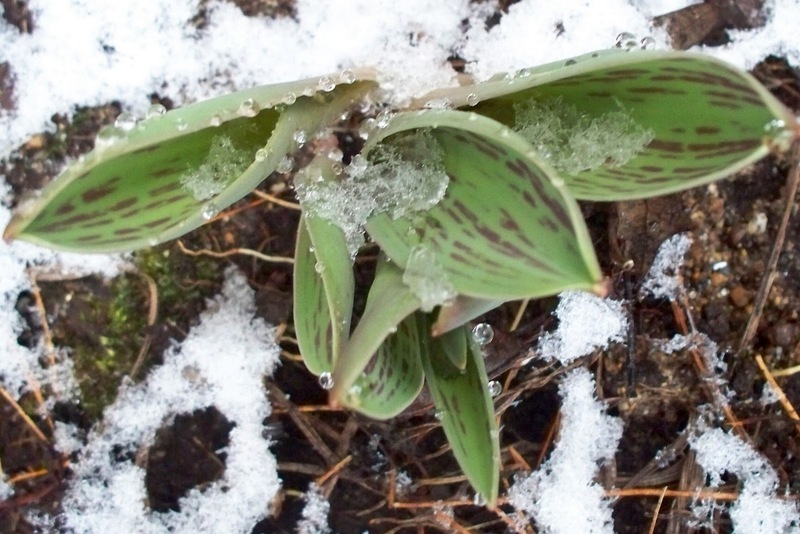 And beautiful the photo of the hardy brave little tulip poking up through the snow. 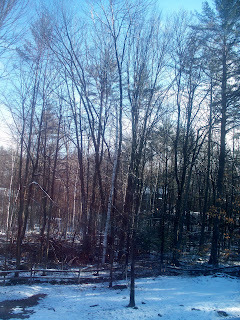 Our snow is long gone here, and I can smell the earth stirring when the sun warms it. It is awesome! The eternal cycle, which goes on no matter what. such lovely haiku. may you be like those tulips, blooming in your own time. Beautiful photo and haiku -- love it! beautiful image, and AT LAST even if you did get snow, to see the earth in New England. I smile. the chip:monks made it through a tough winter! So glad that...there you are. How lovely, Laura!!! I'm excited for spring (I feel so lucky to have a vacation here in Canada!) because it's my first time to experience such season. Back in the Philippines we only had sunny and rainy seasons. Yes, we a blessed to be. And ordinary is not bad really. When we can make a plan. Execute. And have a very ordinary day. Each is a blessing! I looked in the garden and some tulips are coming up, too. Need to get out there. It's been snowing off and on, just a little, just enough to let us remember, it's beauty. I imagine the tulips did call to you "Here I am" what a wonderful discovery of a brighter day ahead.lovely! Congratulations on your tulips! They must love you a lot. And how could they not!? Lovely. I live in the desert southwest, so we have a few short days of spring before summer-like temps come barreling in! Lovely, Laura...the words, the picture...the sentiment. Thank you....needed to read this. beautiful photos and wonderful haiku! A reminder that snow in Japan, somewhat untimely and unwelcome, still serves to awaken spring! the gift of seasons changing is indeed a gift. good reminder! Lovely haiku. I like the "Here I am" positive attitude. Reminds me of times when I reached my voice across mammoth, redrock canyons in the Southwest...to announce myself to the spirits of that place and the ancestors. Hearing my voice reverberate for what felt like miles, the echos came back to me carrying something more than what was first yelled. "I am here...We are here". Laura, I love the way in which the little speckled leaves welcomed you as you came out the door. Can there be anything more welcoming than that first harbinger of spring? And Hineini--to find ourselves exactly where we are--the best blessing on such a day. Lovely and perfect image... I liked this Haiku very much... Thanks for sharing..
Spring is so delightful. Tulips :) My mom taught me to plant them and a few other bulbs inside around now. Our tulips should be blooming at the end of the week. So lovely. I've been noticing how spring comes even as winter refuses to give way, and it will have its day. So if we can just be here, as you so beautifully wrote, all is well. Beautiful images and haiku. And what a soulful attitude to say "here I am" in the midst of spring snow. Lovely! There's a poignancy about the last bit struggle of winter, isn't there? Your poem really gave me that "aaah" feeling, Laura.. thanks.. Living in Southern California we are spoiled to the early spring, our crocus, daffies and tulips are in full bloom, it is always a joy to see them poking through the ground !